There are many different World War II stamps. The value and price on World War II stamps tend not to be much different to their face value due to the quantity issued. There are many different topics that can be considered World War II stamps, but there are broadly two categories – those issued during the war and those issued after to commemorate the war. The stamps issued after the war are either issued singly or as part of set to remember the war as part of a wider set such as planes, military or historical moments, or important people. 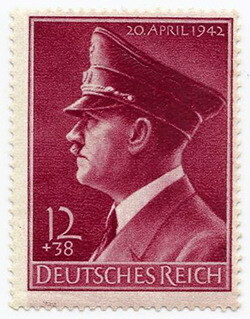 An example of the stamps of some note issued during World War II, probably for the wrong reason, are those issued with Hitler’s portrait on them. Hitler decided that stamps issued should have his image portrayed. He also received a “royalty” for the stamps being issued with his image. World War II stamps issued by the Royal Mail on 13 May 2010 were titled Homeland Heroes (the video above shows them and talks to three people featured on the stamps). They have been issued to commemorate 70 years since Churchill gave his Blood, Toil , Sweat, and Tears speech to Parliament. The collection pays tribute to the people who stood up to Germany during those dark days of the Blitz, a defeat in France. The Homeland Heroes stamps are First-Class Winston Churchill, First-Class Land Girls, 60p Home Guard, 60p Evacuees, 67p Air Raid Wardens, 67p Women in Factories, 97p Royal Broadcast, 97p Fire Service. Also issued was a Dunkirk miniature stamp which includes the following First-Class Evacuation of British soldiers from Dunkirk beach, 60p The Little Fleet, 88p British soldiers on board the Royal Navy Destroyer, 97p Two Boats from Dunkirk. Determining the value of World War II stamps is best done using a stamp catalog. As noted above, most stamps are worth around their original face value because of the number of stamps that are issued, but check in a stamp catalog if you are unsure.